Cthulhu Cultus - ZineWiki - the history and culture of zines, independent media and the small press. 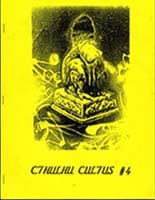 Cthulhu Cultus was a literary fanzine published by Philip Marsh and Tani Jantsang. The Associate Editor was James Ambuehl. Cthulhu Cultus was published in Florida, U.S.A. The first issue appeared in 1995. It was devoted to weird, supernatural and horror fiction and poetry with an emphasis on H. P. Lovecraft's Cthulhu Mythos. Contributors included James Ambuehl, Tracy Ambuehl, Kenneth J. Beattle, Robert Bee, R.D. Bookout, Crispin Burnham, R. S. Cartwright, Lee Clark, Jason Gridley, Peter F. Guenther, Jonathon William Hodges, Tani Jantsang, J.W. Kelley, D.F. Lewis (Nemonymous), Philip Marsh, Andy Nunez, Brian Nutter, Duane Pesice, Robert M. Price (Crypt of Cthulhu), Joseph S. Pulver (Cthulhu Codex), P.J. Roberts, Ian Rogers, Kevin Eric Sheridan, Ron Shiflet, Kenneth Silver, G.W.Thomas, John H. Toon, Ray Wallace, and Peter A. Worthy (Al-Azif). Illustrations were done by T. Marsh. Eighteen issues of Cthulhu Cultus appeared, the last one in 2001. The editors also recorded a 60 minute CD of original Cthulhu Cultus Music. This page was last modified on 19 February 2012, at 15:31. This page has been accessed 13,212 times.